Sindy MOC outfit 1975 Esmeralda, issued by Florido, Spanish exclusive. Sindy MOC outfit 1975 Flor issued by Florido, Spanish exclusive. Sindy MOC outfit 1975 Nieve (Snow), issued by Florido, Spanish exclusive. Sindy MOC outfit 1975 Summery Days. Sindy MOC outfit 1976 About Town. Sindy MOC outfit 1976 Cookin variation. Sindy MOC outfit 1976 Pretty Pinny. Sindy MOC outfit 1976 Seaside Special. Sindy outfit 1977 High Style NRFP. Sindy outfit 1978 Holiday Girl NRFP, package has some wear. Sindy MOC outfit 1981 Mix n Match. Sindy MOC outfit 1982 April Showers. Sindy MOC outfit 1986 Mode Fashions, yellow dress. Sindy MOC outfit 1986 Mode Fashions, Beach. Sindy MOC outfit 1991 T-shirt with Paul print. Sindy outfit 1960s Weekender and Skating parts tlc. Sindy outfit 1963 Leather Looker, red shirt with copper buttons, flawless. Sindy Paul outfit And so to bed, tiny spot on front (see pic), otherwise excellent, htf. Sindy outfit 1963 Pony Club, with htf spurs and curry combs, hardly any playwear. Sindy outfit 1964 Bridesmaid, some fraying on ribbons, popper missing on jacket, colors faded on flowers, all in all excellent. Sindy outfit 1964 Sleepy Time, from play lot, excellent, with many htf accessories, not complete. Sindy outfit 1965 Emergency Ward, white bit yellowed from storage, otherwise excellent. Sindy outfit 1965 Seaside Sweetheart, the most htf parts, find the coat and bag and you the outfit complete. Sindy outfit 1965 Undie World, without the usual fraying, excellent. Sindy outfit 1966 Bowling, complete minus one sock, excellent. Sindy outfit 1967 Happy Traveller, excellent condition. Sindy outfit 1968 Mini Gear, as new condition, with htf shoes. Sindy outfit 1971 Bridesmaid, perfect, with flowers from bouquet (ribbon missing). Sindy outfit 1972 Blazer Way, crisp fabric, looks as new, but poppers inside are missing. Sindy outfit 1972 Lovely Lively, some spots on the belt, needs washed, jumpsuit perfect. Sindy outfit 1972 Weekend, complete set. Good condition, besides one popper missing and some spots, needs washed. Sindy outfit 1973 Casual Cords, with white bow shoes. Sindy outfit 1973 Flares Lovely Lively doll, some playwear, fragile seam and could be refreshed (nothing major). Sindy outfit 1973 Funtime doll, excellent. Sindy outfit 1973 Gaucho, minor playwear. Sindy outfit 1973 Poncho, htf pink variation, with blue bow shoes, excellent. Sindy outfit 1973 Lounger, yellow blue variation, white bow shoes, very minor spot on bodice (see pic) pin prick size, otherwise excellent. Sindy outfit 1973 Lounger, with bow shoes, one fragile spot in the seam (see pic), otherwise excellent. Sindy outfit 1973 Spring Date, with blue bow shoes, perfect. 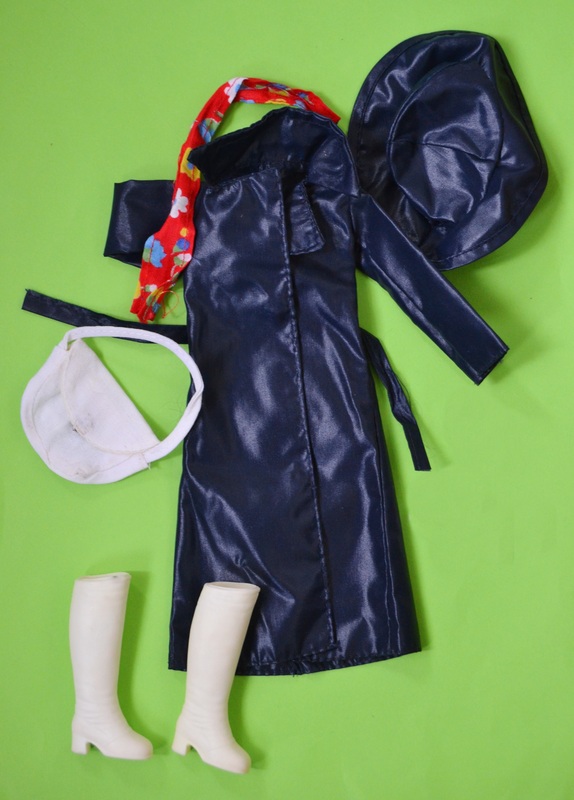 Sindy outfit 1973 Theatre Date, perfect except for a popper repair. Sindy outfit 1973 Zing a Ding, waist coat, without the usual fading, excellent. Sindy outfit 1973 Zing a Ding, with red bow shoes, minor playwear. Sindy outfit 1974 Blazer Beauty, white sandals, perfect. Sindy outfit 1974 Casual Day, flawless. Sindy outfit 1974 Feel Free. Sindy outfit 1974 Lovely LIvely Ship Ahoy, white bow shoes, excellent. Sindy outfit 1974 Spring Date. Sindy outfit 1974 Wrapover, with htf head scarf and red bow shoes, perfect. .
Sindy outfit 1976 Aquamarine, excellent. Sindy outfit 1975 Baggies, with red bow shoes, one stitch needed on seam, otherwise like new. Sindy outfit 1975 Jumper n Jeans. Sindy outfit 1975 Lovely LIvely, with headband and bow shoes, like new condition. Sindy outfit 1975 Sindy outfit 1977 Marguerite, complete with scarf, belt and bow shoes, flawless. Sindy outfit 1975 Pleasant Dreams, excellent. Sindy outfit 1975 Quick Change, perfect. Sindy outfit 1975 Smarty Denims, with white bow shoes. Sindy outfit 1975 Snug Winter, pink variation, has paled, probably due to washing. Sindy outfit 1975 Summer Smock, with htf blue bow shoes. Sindy outfit 1975 Sunflower, white sandals, two minor pin pricks on yellow skirt, otherwise excellent. Sindy outfit 1976 About Town, with shoes. Sindy outfit 1970s ballerina, excellent. Sindy outfit 1976 Barndance, excellent. Sindy outfit 1976 Bridesmaid, matching cap for sale in accessory department. Sindy outfit 1976 Cookin, some playwear, excellent and complete. Sindy outfit 1976 Disco Date, with play wear. Sindy outfit 1976 Feeling Frosty, replacement buckle, small dent on front. Sindy outfit 1976 Funtime doll. Sindy outfit 1976 Happy Days, excellent. Sindy outfit 1976 Jet Setter, with htf blouse. Sindy outfit 1976 Jetset, needs to refreshed from storage, not now, but excellent. Sindy outfit 1977 Lunch Date, unplayed with condition, complete. Sindy outfit 1976 Mandarin, spotless. Sindy outfit 1976 McSindy white blouse. 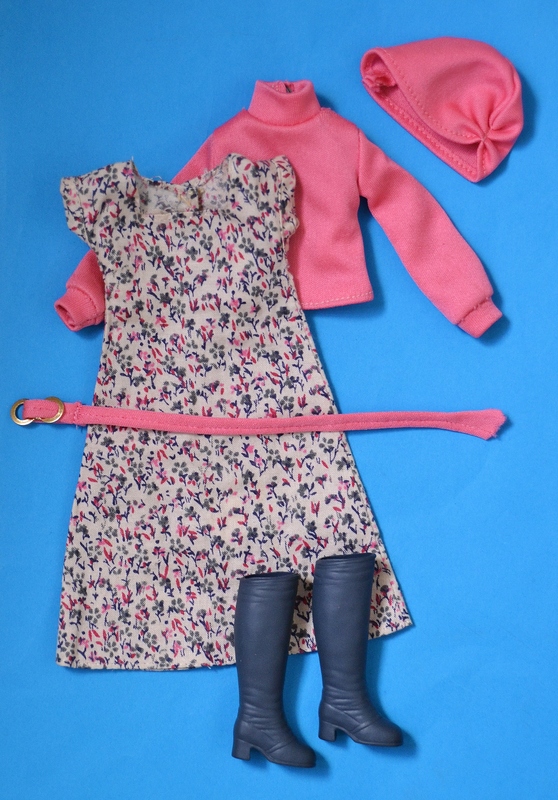 Sindy outfit 1976 Mix n Match. Sindy outfit 1976 Mix n Match, red shirt. Sindy outfit 1976 Riding Out, perfect, with crop (not in pic). Sindy outfit 1976 Summery Days. Sindy outfit 1976 Sunspotter, minor playwear, mainly the elastics somewhat stretched out, excellent. Sindy outfit 1976 Wedding Bells, hardly any play signs, excellent. Sindy outfit 1977 Romany Girl., no playwear. Sindy outfit 1977 Autumn days. Sindy outfit 1977 Bath in Style, excellent. Sindy outfit 1977 City Shopper. Sindy outfit 1977 Country Set with boots, from play lot, excellent. Sindy outfit 1977 Country Set with boots, complete, htf in complete condition. Sindy outfit 1977 Little Things, bit wrinkled from storage, in as new condition. Sindy outfit 1977 Lullaby Lace, with htf slippers. as new. Sindy outfit 1977 Mix n Match Pink Fun Fur Jacket. Sindy outfit 1977 Mix n Match T-shirts, perfect. Sindy outfit 1977 Mix-n-Match T-shirt, perfect. Sindy outfit 1977 Night Spot, very good condition, with htf head band. Sindy 1977 Out of Town, with brown vessel shoes (not in pic). Sindy outfit 1977 Outward Bound, complete, as new. Sindy outfit 1977 Romany Girl, minor playwear. Sindy outfit 1977 Royal Occasion. Sindy outfit 1977 Sunshine Girl, excellent. Sindy outfit 1977 Weekender doll. Sindy outfit 1977 Weekender T-shirt, perfect. Sindy outfit 1978 April Storms, as new. Sindy outfit 1978 Around Town, with black vessel shoes, perfect. Sindy outfit 1978 Coffee Morning, excellent. Sindy outfit 1978 Cold N Frosty, some playwear, no apparent flaws. Sindy outfit 1978 Cosy Wrap, some playwear, no flaws. Sindy outfit 1978 Country Cousin, excellent. Sindy outfit 1978 Sporting Life, no playwear. Sindy outfit 1978 Sweet Dreams, with htf slippers, as new. Sindy outfit 1978 Undie World. Sindy outfit 1979 Dinner Date, blue variation. Sindy outfit 1979 Mix n Match T-shirt Bow Detail, excellent. Sindy outfit 1979 Premiere Girl, with brown vessel shoes, excellent. Sindy outfit 1979 Seaside Special. Sindy outfit 1979 Tartan Touch. Sindy outfit 1979 White Wedding. Sindy outfit 1979 Winter Nights, some playwear. Sindy outfit 1980 Baby Blue. Sindy outfit Coffee Party with shoes. Sindy outfit 1980 Gingham Girl. Sindy outfit 1980 Gypsy Lady, with blue sandals (found later, not in pic), excellent. Sindy outfit 1980 Holiday Girl, excellent. Sindy outfit 1980 KLM, complete, flawless. Sindy outfit 1980 Pink Frilly, with slippers. Sindy outfit 1980 Styling doll, European issue. Sindy outfit 1980 Summer Nights, perfect. Sindy outfit 1980 You and Sindy doll, excellent. Sindy outfit 1981 Bo Peep, excellent. Sindy outfit 1981 Free Wheeling, with htf scarf. Sindy outfit 1981 Fun Suit, with yellow trainers. Sindy outfit 1981 Regency Girl, excellent. Sindy outfit 1981 Show Stopper, excellent. Sindy outfit 1981 Sleep Tight. Sindy outfit 1981 Stormy Weather, excellent. Sindy outfit 1981 Sweetlife, excellent, with htf purse. Sindy outfit 1981 Work & Play. Sindy outfit 1982 Dancer doll, excellent. Sindy outfit 1982 Dancer, skirt only, perfec.t. Sindy outfit 1982 Fair Lady, ribbon umbrella missing, otherwise new condition. Sindy outfit 1982 Rodeo, some playwear, no flaws, with htt white cowboy boots. Sindy outfit 1982 Spring Time, seam repaired, otherwise excellent, with htf bag. Sindy outfit 1982 Warm n Cosy, excellent. Sindy outfit 1983 Western frings parts and red scarf, excellent, vhtf, to complete your Western doll outfit. Sindy outfit 1983 Alpine Sports. Sindy outfit 1983 Bright ’n Breezy, no flaws, htf. Sindy outfit 1983 Casuals 44003 red swimsuit and jacket, excellent. Sindy outfit 1983 Casuals 44004 skirt and top, flowers, excellent. Sindy outfit 1983 Gala Night, with htf black sandals. Sindy outfit 1983 Holiday GIrl with htf glasses, sandals and radio. Sindy outfit 1983 LIttle Things lingerie, excellent. Sindy outfit 1983 Pony Rider, with crop cap and boots. Sindy outfit 1983 Star Dance, complete, with htf head band, shoes and leg warmers, excellent. Sindy outfit 1984 Beach Party doll. Sindy outfit 1984 Checkmate, perfect, as new, with htf shoes and hat. Sindy outfit 1984 Dream Time, excellent. Sindy outfit 1984 French Connection, some playwear, excellent. Sindy outfit 1984 Funtime doll, excellent. Sindy outfit 1984 Highland Fling belt has some wear. Sindy outfit 1984 Warm n Cosy, with htf blue slippers. Sindy outfit 1985 Sugar Candy, complete, excellent. Patch outfit Patch Birthday Party, flawless, very minor playwear.